The release of one of Lente Roode’s cheetahs, Tillie, into the wild on 29 February 2019 was the culmination of what she does at the Hoedspruit Endangered Species Centre. Yesterday, Monday 11 March, after six weeks in Pidwa, Tillie was released into a 2 000 hectare enclosure where she will remain until she can fend for herself by hunting independently. For more information read the news release and the blog below. “I breed cheetahs for release back into the wild. It is my passion and I believe the right thing to do to maintain the species that is listed as ‘vulnerable’ in the IUCN Red List of Threatened Species. 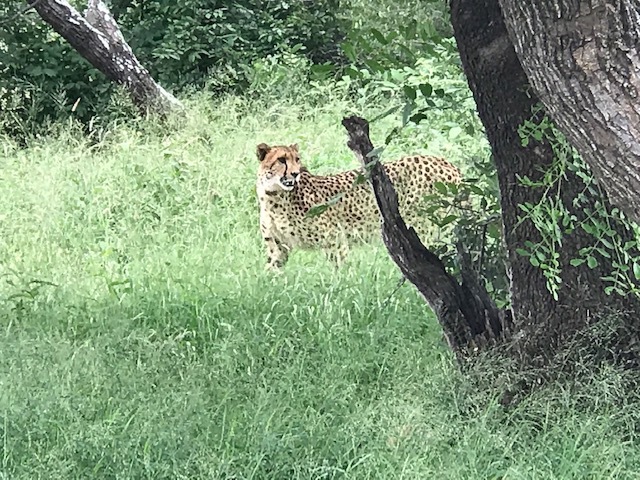 And yet, every time I release a cheetah and bid it farewell, I am overcome by emotion and feel as if I am losing a child or maybe more accurately, that I am abandoning a child. Seeing her again yesterday morning filled me with pride that she had adapted so well in her new environment. She was darted in the boma area where she has been for the past six weeks, collared and then transported in a cage to the 2 000 hectare enclosure where there are no predators and where she will spend the second phase of her release. She will now have the opportunity to hone her natural hunting skills. During this period she will be monitored daily and only provided with meat should she fail to hunt successfully. When she stepped from the crate in the scenic setting next to the dam, she did so with caution, looking back repeatedly, yet curious to explore this new environment. And as she walked away, I silently prayed that this day that had started with soft rain and the biggest rainbow that I have ever seen in the bushveld would augur well for her and that she would adapt as well in this second phase of her release as she had in the first. Born as one of a litter of three to dam Thea and sire Tiaan on 1 May 2012, Tillie and her siblings were raised in captivity at HESC, meaning they were raised in a large enclosure protected from predators and we monitored their health and progress. I remember when the cubs were born – tiny balls of fur, with eyes tightly closed, that could fit into the palm of my hand, had I chosen to pick them up. However, we don‘t intervene in births or hand raise cubs unless the mother dies or abandons her litter, believing that nature must take its course. In the wild, only two percent of cheetah cubs reach adulthood as they are killed by other predators. Tillie and her siblings survived this lot and for that we are grateful. We’ll keep you posted on her progress in the Pidwa Wilderness Reserve.